Take a look at most US cars designed and built in the late fifties and early 1960s. They are huge, drenched with chrome and still sprouting the last vestiges of tail fins. Today they just look old. The Avanti may be the lone exception. The Avanti was designed by Raymond Loewy, an industrial designer who had designed other Studebakers. It was a last gasp effort by Studebaker to bring some excitement and respectability to their showrooms. In that regard it didn't work, it was just too late. In terms of design though, it worked brilliantly. The Avanti stayed in production for almost 30 years. After the closure of Studebaker's factory in December 1963, the Avanti model name, tooling and plant space were sold off to two South Bend Studebaker dealers and the car became known as the Avanti II. Originally, the Avanti II was built on leftover Studebaker chassis'. In 1987 the Avanti started using a Chevy Monte Carlo platform as the basis of the car. There were several Avantis built on Chevy Caprice platforms in the late eighties and early nineties, but, in my opinion, the modifications that had to be done to the body to fit it to the bigger frame killed the car's classic looks. To the best of my knowledge, Avanti is no longer in business. There were no Avantis made after 1991, but in 2005 a company was planning on reviving the car, this time based on a Mustang platform and using Ford running gear. However, in December 2006, Michael Eugene Kelly, the owner of the new company, was arrested. Kelly is suspected of running a $400 million Ponzi scheme from 1992–2004 (before it was fashionable to do so). As of 2008 he was still in prison awaiting trial. (You can read all about him here) The website for the company still exists and shows pictures of the car, which I find much less appealing than the older models. I never had any real urge to own an Avanti. But, a few years ago I saw one at a local car show and talked a bit to the owner. He was incredibly nice and had the right attitude about his car. The more we talked and the more I looked at the car, the more I began to appreciate it. It's not on my Top 10 list of cars I want to own, but if I had unlimited funds and storage space I would definitely buy one. The Avanti is a hand built car (as the seller points out though, it is not a kit car) so you can expect that a few things won't line up as perfectly as they would in a mass produced car. Even with the big Chevy V8 in it, it's not a fast car. Handling and stopping power are said to be about the same as any older American car, which is to say OK at best. 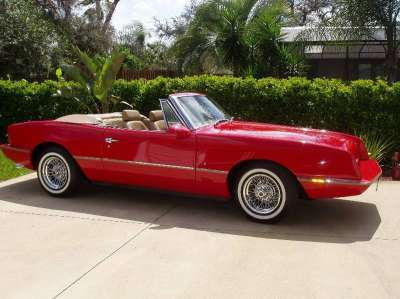 The car listed on eBay is one of the later, Monte Carlo based models and a convertible (Studebaker never offered the car as a convertible - Avanti Motors introduced it in the eighties). It has just 15K miles on it and appears to be in great shape. The red over white color combination is perfect for this car and the chrome wire wheels give it a cool retro look. The newer style dash has a European look to it and somehow manages to look both modern and classic at the same time. At $29,500.00, it's not cheap, but based on the pictures, it's the nicest one I've ever seen. Click here to see the eBay listing for this 1987 Avanti II convertible. Click here to find the Avanti Owners Association International website.